In his cell at the Rhode Island Department of Corrections, Richard Paiva has slept without winter clothing and in unsanitary living conditions since being incarcerated in 2009. In most other states, Paiva would be able to successfully sue the state for violation of his civil rights. Rhode Island, however, is an anomaly. Since 1909, the state has had a ‘civil death’ law, which declares people sentenced to life in prison to lose all their civil rights, even if granted parole. In 1937, there were 18 states that still had ‘civil death’ laws on the books; in 1976, 13 states still had the law. Today, only New York and Rhode Island retain forms of the law for people sentenced to life imprisonment, while Idaho retains a version of the law for all incarcerated people. According to Steven Brown, executive director of the American Civil Liberties Union Rhode Island, most other states have repealed the statute through legislative action. In 2007, after efforts from the ACLU, a Rhode Island representative introduced a bill to repeal the statute. Although the bill was passed in the legislature, the governor at the time, Governor Donald Carcieri, vetoed the bill. He argued that “the loss of property, and even the right to marry, is not unreasonable” for those serving life sentences, and that there was “insufficient reason to pass legislation,” according to the ACLU. The legislature decided not to try to override the veto. Incarcerated people like Paiva are civilly vulnerable to torture by prison guards and other forms of cruel and unusual punishment. They could go to court to challenge the conditions of their confinement, but the DOC could simply argue that they are simply ‘civilly dead,’ a legal argument that deems almost all of the plaintiff’s complaints practically irrelevant. To understand the ‘civil death’ law in all its complexity, it is necessary to first contextualize it with a long history of systematic racism and disenfranchisement. To scholars and activists like Marco McWilliams—a Swearer Center Junior Fellow and Practitioner in Residence at Brown University—the ‘civil death’ law parallels the violence of the Thirteenth Amendment, as well as the Dred Scott case in 1857. In that case, Judge Roger B. Taney wrote a 200-page legal argument for the disenfranchisement of Scott, an enslaved man who attempted to sue for his freedom. However, at the very end of this document, Judge Taney asserts that all of that legal argument is unnecessary. The only requisite argument is the fact that Scott is not a legal citizen and, therefore, has no rights. The court set a precedent that no Black people—free or enslaved—could claim US citizenship, and therefore Black people were unable to petition the court for their freedom. McWilliams argued, in an interview with the Indy, that ‘civil death’ is an effort by the state to create a “sub-human status” in a criminal legal system that already thrives on unfair power and racial dynamics. Similar to how people like Paiva are stripped of legal rights, recently emancipated slaves were ushered into the prison system and stripped of legal rights. To McWilliams, the civil death law is simply a continuation of the country’s long history of disenfranchising incarcerated people. Paiva initially filed a suit against the DOC, but the DOC asked the court to dismiss the lawsuit due to the ‘civil death’ statute. This caused the ACLU of RI to file a brief asking the Superior Court to reject the DOC’s claim that Paiva cannot sue for violations of civil rights. According to the ACLU’s court brief filed by Deyoe on September 7, Paiva’s case challenges various issues of his confinement as a violation of his constitutional rights. Paiva alleges that there are mice in his cell that pee and defecate on his clothing, bedding, and cell floor on a routine basis, and that steam from showers enters his cell, causing his bedding to become moldy and causing him to suffer from chronic sinus problems and sore throats. According to Paiva, the DOC was aware of the molding but did nothing to help him. He also says that the DOC failed to issue him essential clothing items and the clothing that he was issued was used and unwearable. For these issues, Deyoe mainly argues that Paiva’s allegations constitutes cruel and unusual punishment in violation of the Eighth Amendment of the Constitution. Additionally, he claims that he was denied all access to any newspaper or personal photographs and in solitary confinement denied all visitation and telephone calls, which Deyoe argues violates the Freedom of Speech Clause of the First Amendment of the Constitution. He also says he was disallowed an hour of outdoor recreation and participate in any rehabilitation programming. In addition to Paiva’s lawsuit, there is another challenge to the ‘civil death’ statute pending before the Rhode Island Supreme Court, filed by attorney Ronald Resmini. Resmini is defending Dana Gallop, a pretrial detainee at the Adult Correctional Institute who sustained severe and permanent injuries after being attacked by another inmate on April 26, 2010. Gallop filed an initial complaint in 2010 and then amended the complaint in 2013 to add that his claims were based on violations of his civil rights because the prison guards did not protect him. The DOC’s counsel argued that the ‘civil death’ statute protected the prison guards. However, according to Deyoe, it is more likely that legislative action, rather than legal challenge, will lead to the repeal of the statute. “If the Attorney General’s office keeps trying to enforce the statute, there might be enough of a groundswell that they can get the statute repealed in the next session,” Deyoe says. Unlike then-governor Carciari’s vote of the statute’s repeal, this time around, Deyoe believes it is more likely that Governor Gina Raimondo will pass a bill similar to the one vetoed in 2007. By “displacing” emancipated slaves to the prisons, structural racism and discrimination found a home in the inner workings of the state prison system, according to McWilliams. The Thirteenth Amendment allowed the criminal legal system to continue to disenfranchise recently emancipated Black slaves. 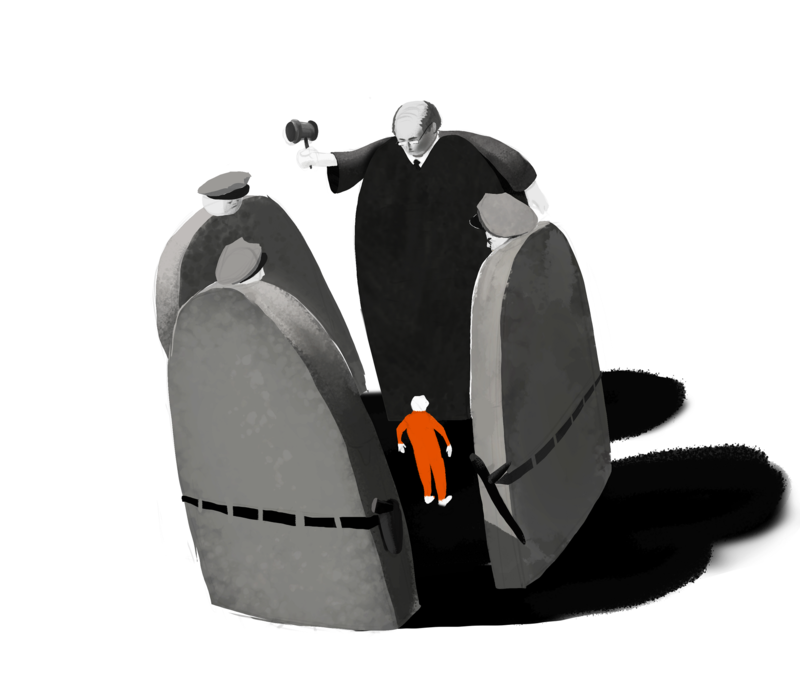 Today, ‘civil death’ represents another effort by the state to disenfranchise and punish people in the prison system. However, to Deyoe, the problem with the statute extends beyond simply an unequal power dynamic between people in prisons and the state, but to a basic understanding and sympathy for those who are serving life sentences. McWilliams often asks his students: “Should people in prison be allowed to vote?” He finds that often times his students who oppose incarcerated people’s right to vote give into the narrative that incarcerated people are inherently immoral. He believes that this conception is what allows the ‘civil death’ law to still be in place in Rhode Island. ALICIA MIES B’21 thinks the state shouldn't determine humanity.